This ice cream is very easy to make and it is really very flavorful with the essence of rose water. It can be made very quickly as we use the whipping cream. In a bowl add the sugar and whipping cream. Add rose water and rose color. Start whipping it at level 1 speed itself. The whipping cream becomes thick. Stop at this point, because over whipping, makes the cream to butter and the ice cream would taste so butterish. 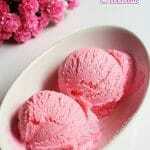 Serve the cool cool flavorful rose milk ice cream. Do not over do the whipping cream, as it becomes butterish.